$7,100 In Cash And Prizes @ MoneyCrashers!Eliminate The Muda! Eliminate The Muda! 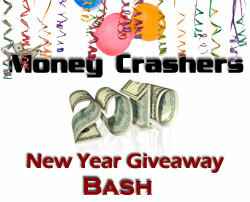 has teamed up with MoneyCrashers and many other personal finance sites for a 2010 Giveaway Bash! In all there is $7,100 in cash and prizes that will be awarded based on a random drawing on February 3rd, 2010. Over $1,800 in cash, nearly $100 in gift cards including $100 worth of Barnes & Noble Gift Cards from Eliminate The Muda!. There is also a long list of prizes including a iPods, Kindles and personal finance books galore. 1) Sign up for the MoneyCrashers Mailing List (Required) and then take advantage of other ways to earn more entries. 3) Performing various other tasks will earn you even more entries. Sign up for the MoneyCrashers RSS feed for an additional 15 entries. Please take a moment to review the official rules and then sign yourself up and win some money and prizes to start the New Year right! 2 comments to $7,100 In Cash And Prizes @ MoneyCrashers! Tweet Tweet Tweet… The more you Tweet, the more you might keep!